We know you deserve better… You work hard and play SMART, so we have designed and created a Twin Engine Cat that will rise to every occasion and take you places in Style and Comfort that Only True Boaters and Anglers understand. Our Newest Twin Vee is the 240 CC "Center Console” PowerCat, an all composite, multi-hull boat that is an exercise in form, function, stability and ride quality. For those who want more deck space to fish, entertain or cruise without breaking the bank, The all New 240 Center Console PowerCat is what you have been waiting for. Exceptional Comfort with a premium interior makes every boating experience enjoyable whether you're heading out for a day trip or escaping on a adventure to get away from it all. Time is your greatest luxury, spend it on a Twin Vee 240 Center Console PowerCat. 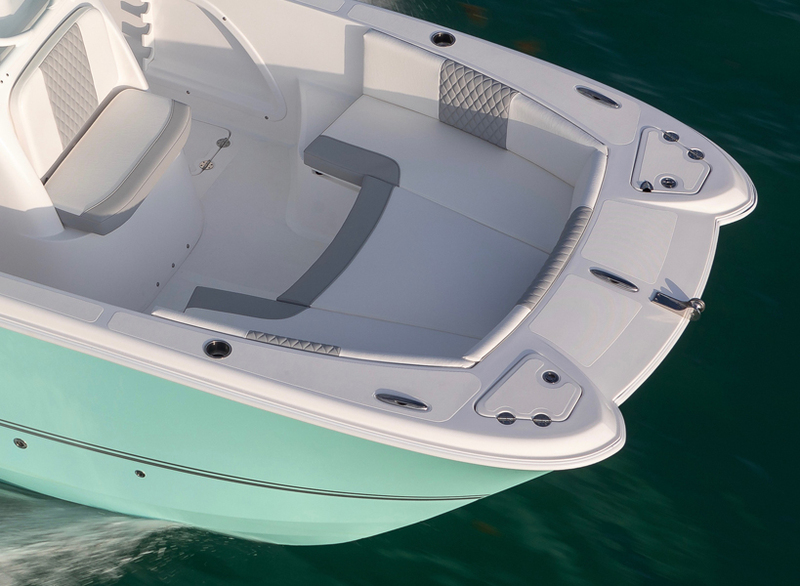 The bow of a dual-hull Twin Vee offers one of the widest bow’s in the marine Industry. There is no denying the added roomy seating this boat offers. The 240 CC is designed with entertainment and versatility in mind. Features include wrap-around seating with all the cushions, removable backrests, 2 easily accessible large storage boxes, drink holders and speakers to play your favorite tunes. Two large storage boxes at the bow will give you plenty of space to stow away your items. Both boxes are insulated and can be used for coolers or dry storage. With a dual-hull boat, you have more room to easily board your boat with the standard stainless steel multi-step ladder. It stows away when not in use for a clean obstruction-free rear deck. Inside the console, there is a built-in lockable storage area. This enclosed space can be used as a changing room or for the storage of bulky items. On the back wall, there's access to all of the connections to the electronics and fuses: very convenient for quick troubleshooting. Your Twin Vee has a port and starboard anchor hatch. The hatches have GemLux tension-resistant hinges. It can also be used to store extra rope or for dry storage. Comfort and function meet when it comes to this super comfy leaning post. It is designed to accommodate two adults and allow you to operate your Twin Vee standing up or in a seated position. Additional features include a footrest and rod holders. 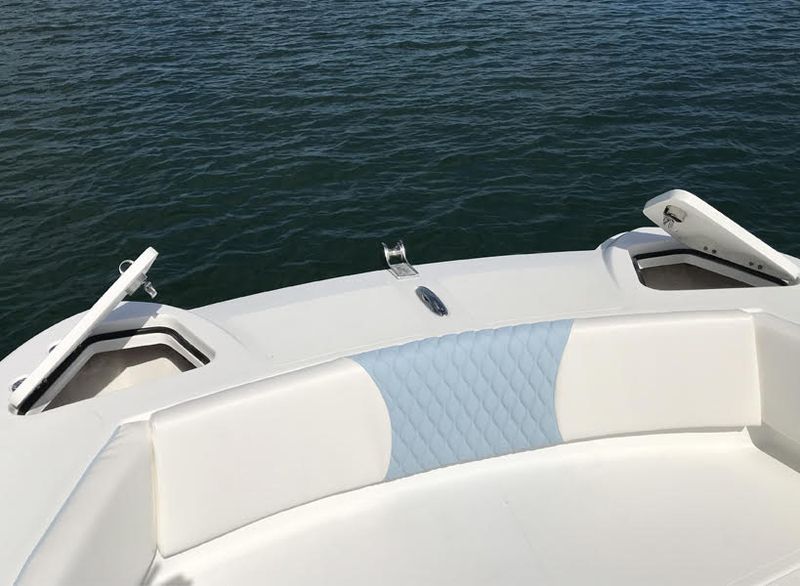 One of the great attributes of having a dual-hull boat (240 CC), is the ability to design fish boxes port and starboard with the dual hulls offering the depth on both sides of the boat. GO FISH. Comfortable console-front seat with backrest. Also boasts a built-in insulated 20 gallon cooler. Your 240 CC comes standard with an anodized aluminum Weblon Soft Top. The optional Fiberglass T- Top is packed with convenient features which includes anchor light, map reading light, spreader light, rocket launchers, electronics box and outrigger pads. When the sun goes down, the cockpit comes to life. The optional lighting package is as beautiful as it is functional. A blue glow covers every inch of the cockpit for safety as well as aesthetics. The stern transom offers an oversized livewell and an additional cooler, both insulated and located for the true angler that knows how to maximize the boat’s fishability. Coolers can also double as coolers for drinks and food. Twin Vee offers four different color hull choices, go light, go white or simply go on your Twin Vee and experience a whole new way of boating. INSULATED COOLER BOX - 10 GAL.